Hot on the heels of of the Alive in the Vortex release comes Live in Tucson: Pinnacle Moments. This can be considered a bookend experience to the recent Vortex album; it was created and recorded February 14th, 2015, 16 months after the L.A. Vortex concert at Tucson’s Solar Culture Galactic Center. After many requests for a CD version from concert attendees and those who viewed the YouTube clips, Steve considered how and when to release this music. It’s happening now. This release presents the highest and deepest extractions from the concert: five nearly all-new pieces captured on a studio-quality live recording within an intimate performance environment. The flow of energy this music holds offers an empowering way to ride an emotional soundwave into the present moment. Starting with the Desert Solitaire soaked atmosphere of the opening piece to the emotion-infused live Skeleton Keys passage on track 4, this music is an essential expression of Steve Roach’s soundcurrent passion. The 300-copy limited edition CD will be the only time this music is released on CD. Last year’s 300-copy Invisible sold out quickly, so don’t miss out on this release. An emusic pioneer of some 35-plus years standing, Steve Roach has lifted his live performance profile over the past few years, starting with his set at the Hearts Of Space Ambicon Festival in 2013. This focus has birthed several of the finest albums of his career, including this gem culled from recent concerts in his hometown of Tucson, Arizona. Starting with a breathing, sighing desert poem and climaxing with a chugging, spiralling Berlin-school sequencer epic, the five new tracks that comprise Pinnacle Moments are exactly that what the title promises. If nothing else the album is proof that old school ambient – that is, sounds that were around before 90’s techno and electronic dance – remains vital, especially in Steve Roach’s extraordinary hands. 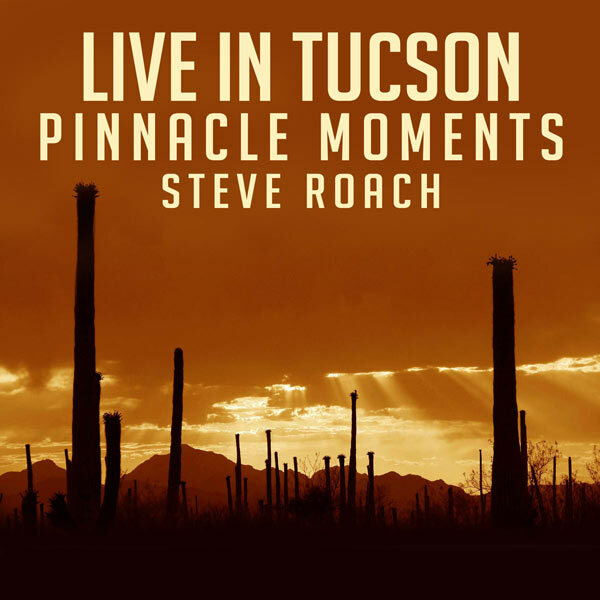 Two live sets by Steve Roach at Tucson’s Galactic Center from February 13th & 14th, 2015, still deeply resonate and Live In Tucson – Pinnacle Moments CD exquisitely documents these unforgettable performances. 4 tracks are taken from Saturday, 14th, while the closing piece was recorded live one day earlier. Graced by stunningly crepuscular golden desert photograph by Kati Astraeir, with additional design by Projekt’s Sam Rosenthal, live recording credit goes to Kelly David and mastering wizardry is provided by Howard Givens in Spotted Peccary Studios. The CD was released exactly at one year anniversary on Steve’s Timeroom Editions and is available in limited edition of 300 4-panel digipak copies. “The Desert Eternal” secures immediate transition with its utterly evocative distant, heavenly cries-like strings bridged with balmily mesmerizing nocturnal musings, while remotely gliding serenity is clandestinely permeated by translucent, yet intangibly immersing artificial beats. Silhouettes of majestic giant saguaros are masterfully revealed, this is undoubtedly Steve Roach at the very top of his innate desert soundcarving. The magic of this wilderness is captured in absolutely authentic way that can be only Steve Roach!!! In the middle the piece metamorphoses into intensely nuanced and tiding panoramic scenario just like the invading, awe-inspiringly cloudscaping spectacle over The Sonoran Desert. I am again sitting in the front row and living the dream!!! 17 and a half minutes of profoundly scenic aural bliss, meticulously symbolizing the American Southwest!!! Triumphantly entitled 8-minute “Endorphin Dreamtime” dives straightly into vigorously glistening terrains fronted by flamboyantly kinetic sequences, which persistently carve emotively spellbinding helixes, while massively expansive undulations are graciously guarding above. Another highly exhilarating performance!!! “Going – Gone”, with 20:33 the longest track, masterfully bridges airy laid-back grooves with gossamer cyber-tech traceries, rumbling primordial subtleties and bizarrely meandering blankets. Over the course ancient ocarina sneaks in, coalesces with additional, intriguingly nebulous tribal artifacts and melts with high-tech sound alchemy, which later shifts into powerfully animated and sinuously outbursting state-of-the-art pulsing adventure counterpointed with weirdly emerging primeval groans. A thrillingly audacious venture to the forefront of phenomenal soundmagic, virtuosically amalgamating ethnographic-driven patterns with hyper-modern trance-inducing shamanic soundsculpting. A truly thunderous listening experience!!! “Skeleton Passage” clocks to 13 and a half minute mark and as indicated by its title, the journey transports the listener into euphoric sonic domains, where perpetually hypnotic sequences paint sharp curves and spirals, while magnificently yearning solitudes inconspicuously pervade along the way and ride atop in delightful symmetry with forefronting, bouncingly mindscaping momentum of sequencer syntaxes. This stellar soundforging seamlessly moves to the closing part, 14-plus minutes long piece “Spiral Passage”. High-cadenced cybernetic transmissions lead the center stage, where abundant array of mesmerizingly spiraling, shimmeringly radiant and insistently ear-tickling synthetic emotions is precisely backed by warmly sweeping desert vistas. The ears of each devoted listener are perpetually bathed in infinitely blossoming and constantly progressing vibes of cyberscaping trance ambient meditations. What a jaw-dropping epic meridian!!! I still clearly remember one night, when journeying and falling asleep with this CD in my discman. Already gone during “The Desert Eternal”, but then randomly reawaken in the middle of “Spiral Passage” and it was like re-entering the aural Eden at The Galactic Center. An ultimate pinnacle moment!!! Sure, I could easily imagine in this live selection also “Today”, one of my undisputable faves by the Master or the part, when par excellence didgeridoo performer Dashmesh Khalsa joined Steve on the stage during the Friday’s show, but then this must have been released as a double album. However, this all-inclusive CD awakes all the aural memories from both these exceptionally breathtaking nights. 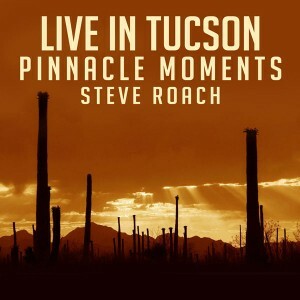 So huge kudos to Steve Roach and all involved for releasing Live In Tucson – Pinnacle Moments, to me, this live album will be always a very special as a truly essential part of the journey, when I was living the dream!!! As mentioned already, this is a limited edition of 300 copies, so make sure to grab your own copy and no matter, if you were among the crowd at February 13th & 14th, 2015 or not. Together with Alive In The Vortex 2CD (Vortex Dome Immersion concerts in Los Angeles, October 25th & 26th, 2013) these live recordings exquisitely demonstrate the spirit and power of the live moment, when the Master connects with his kindred spirits in the audience and shares his eternally creative bravura. And as always, the exploratory odyssey still continues through exploding studio work, so stay tuned!!! We can be all really grateful for such talent, consistency and visionary!!! Thank you so much, Steve!!! In addition to numerous studio recordings every year nowadays, veteran progressive-electronic/ambient composer Steve Roach releases several live performances, both recent and archived, much to the delight of his devoted loyal followers who blind-buy every release without hearing a second of music from it, and to the intimidation and frustration of newcomers unsure of which titles to explore first! Recorded live at Tucson’s Solar Culture Galactic Center (now THERE’s a place to visit just based on the name alone! ), Pinnacle Moments: Live in Tucson 02-14-2015 collects five mostly-new instrumental pieces full of a flowing energy, a showcase of a master of the above mention genres delivering one of his most focused and approachable live concert releases to date. The performance opens gently with the two-part `Desert Eternal’, at first a work of pure ambience of soothing synth caresses, whispering ethereal siren cries, tiny patterings of beats slowly rising around weeping spectral and subtle guitar strains over field-recordings of nature at night, all sounding like one slowly exhaling breath. The second passage moves into a darker droning veils, almost cinematic as they equally balance reflection and confrontation, lifting in groaning harshness at its climax. `Endorphin Dreamtime’ ascends out of the shadows into reassuring heavens, skittering beats bouncing around chilled-out synth breezes. Heady electronic drowsiness and liquid trickles wrap around the senses in `Going Gone’, embracing the ancient world of old with looping tribal drums and wafting flute before morphing into a run of slinking twitchy beats and sly bass murmurs over glacial drones. But it’s the final two tracks that takes the performance to a whole other level. Initially sounding like a throwback to Roach’s Empetus era, `Skeleton Passage’ reveals itself to be relentless and addictive sequencer-driven meltdown, with waves of searing Mellotron-like washes weaving around the maddening beats, sounding like a lost Tangerine Dream piece from the defining Seventies period (prog fans, it also vaguely recalls the electronic/’Tron passages on Norwegian band Smell of Incense’s `A Floral Treasury’ off their `From the Gates of Deeper Slumber’ psych stunner from 1997, but that’s likely a complete coincidence). It seamlessly merges with the placid `Spiral Passage’, undulating beats racing and slowing with expert precision behind the most beautifully joyful chiming loop before joining with the shadows to fade into eternity once more. There is no doubt that Steve Roach constantly puts out a steady series of releases, and it can be quite confusing for potential new listeners to know which albums to choose from to begin with. Pinnacle Moments would be an ideal starting point, as although as a live performance it’s still full of spontaneity and liveliness, the constant percussive elements that eventually show up give this soundwork a more accessible grounding, so it avoids the outright formless and more vague elements of many of his more challenging concerts. It’s also the sort of performance that’s easier to replay and revisit more often, working both as a sumptuous background listen or an exciting carefully evolving soundtrack to take up your full attention. Pinnacle Moments is a first-rate immersive live document of a veteran progressive-electronic composer at the peak of his abilities effortlessly blending a variety of styles both old and new, whilst also sounding more relevant and vital than ever in our modern era, and even somewhat effortlessly cool at the same time.